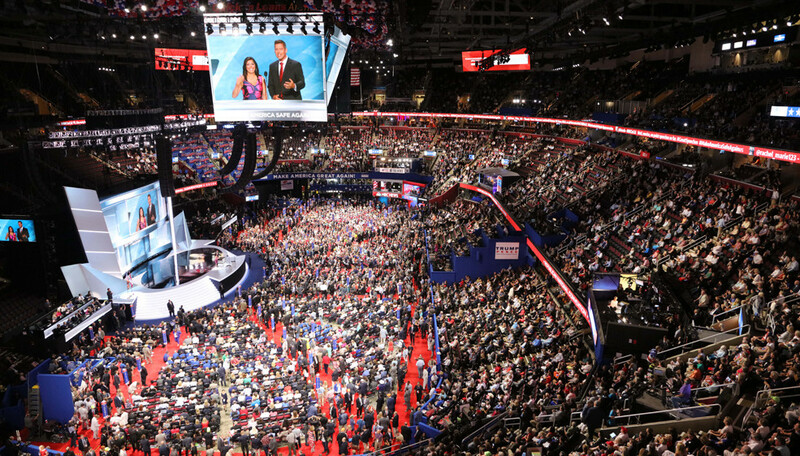 The Republican National Committee hosts the Republican National Convention, a multimillion-dollar, multiday event, which attracts 50,000 attendees, 15,000 media representatives, and millions of viewers worldwide. 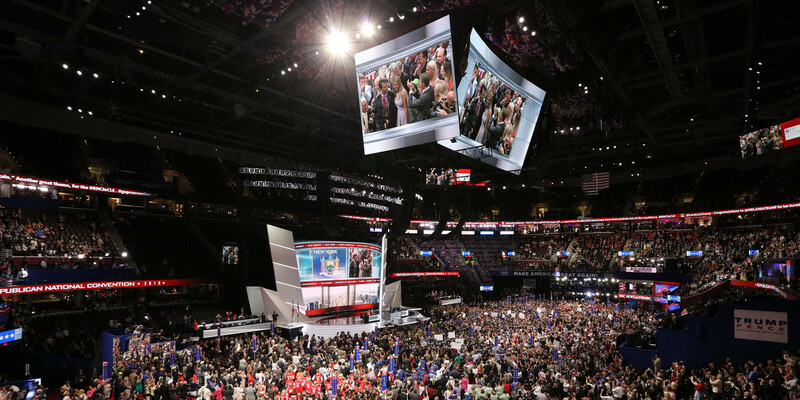 Working together since 1984, the RNC challenged Freeman to transform Cleveland’s Quicken Loans basketball arena into a professional backdrop under stringent security for the nationally televised convention — all with a flexible plan to meet short timelines. To be successful, attendees and viewers would witness a flawlessly executed event revealing no trace of the venue’s original purpose. 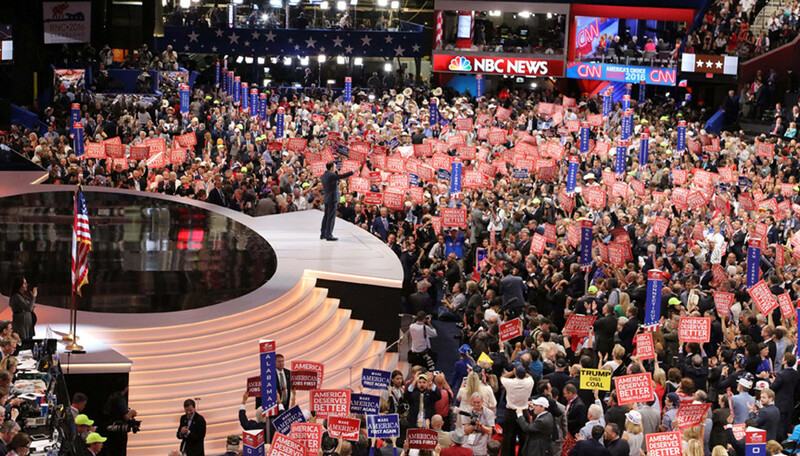 Collaboration with the RNC began almost two years in advance. Our designers and engineers prepared contingencies for the site overhaul long before a final schedule was available. A six-week conversion timeline was estimated, but an unforeseen twist forced the project into rush mode — the Cleveland Cavaliers advanced to the NBA Finals, booking the arena. Ever prepared for the unexpected, Freeman monitored the finals and collaborated with the RNC and arena officials to adjust timelines. Timing eventually shrunk to four weeks, but careful modifications ensured a seamless execution in two-thirds the time. Our teams worked over 118,000 man-hours to install the stage/podium, platforms for 400 press reps, network and affiliate anchor booths, and countless TV cameras. The floor plan also accommodated space for delegates and staff to conduct business, and various locations for 41 air-conditioning units, which were added to alleviate heat generated from the TV production units. The vast conversion required moving thousands of stadium seats — many in place since the arena opened — to be removed, catalogued, stored, and replaced. 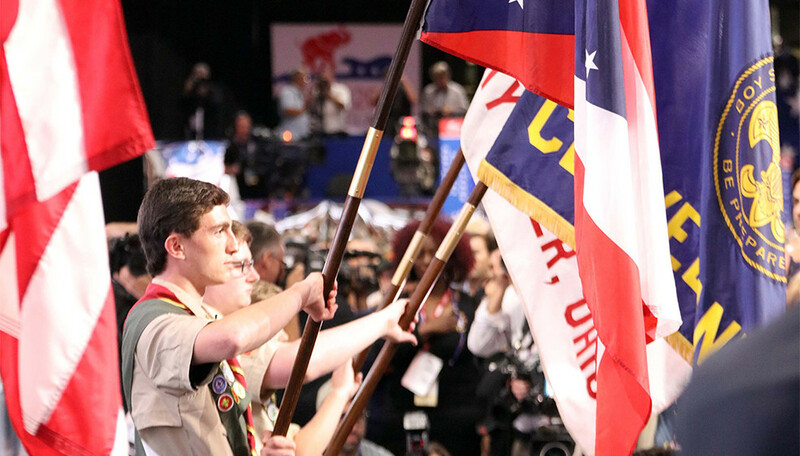 With careful preparation and constant contact, the convention succeeded in a transformed venue. The event itself captured media spotlight and tens of millions of viewers. Even with unique challenges, the experience was a slam dunk. What makes Freeman so qualified is experience, innovative thinking, and calm maturity to respond to ever-changing requirements in a dynamic environment with an absolute deadline. They’ve successfully converted arenas into our convention sites in multiple cities, so we had the utmost confidence they would come through — and they did!